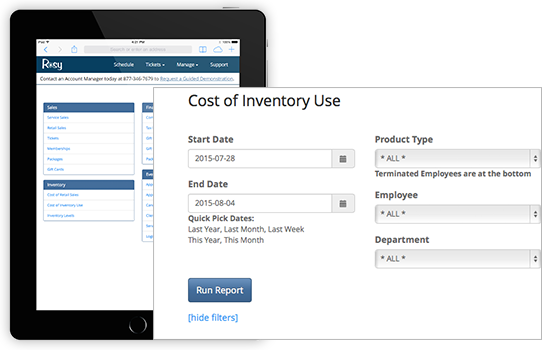 With over 100+ reports, Rosy’s business management software lets you manage your entire business and financial history in the cloud. Rosy takes business management to the next level. With advanced reporting, detailed financial records, robust salon point of sale software and integrated online customer scheduling, you won’t know what you ever did without her. Rosy’s unique access rules allow your employees to stay in touch with their personal progress and have real time access to their schedule and reports. Detailed financial and performance reports are indispensable salon management software tools. Access the information from your home or any Internet location so you can make informed management decisions to grow your business and manage your staff to its fullest potential with spa software and salon software.